David Farrington has almost 800 published works, and he received the Stockholm Prize in Criminology (criminology’s Nobel Prize) in 2013. He was centrally involved in founding the British Psychological Society’s Division of Forensic Psychology in the 1970s, chaired that Division in the 1980s, and is now an Honorary Fellow of the BPS. Alice is the youngest of David’s three daughters, and is herself a clinical psychologist, working for Berkshire CAMHS. Dad, am I right that the Cambridge longitudinal study was your first job after you finished your PhD on how people remember three-digit numbers? How did you get the job? Well, I got it because I knew how to write Fortran programs. When I started my PhD in 1966, my supervisor said that he thought computers were the thing of the future, so I should learn how to write Fortran programs. So that’s why I was hired to work on the Cambridge study, because I had the computer skills to analyse the data. When you set out, it was quite groundbreaking to apply the scientific method to the study of human behaviour, to see which factors were associated with criminal behaviour through a large longitudinal study. I always felt that your main interest was on ‘pushing back the boundaries of knowledge’ and that you were a pure empiricist… you weren’t really that interested in criminals per se. That might sound strange given the half century that you have spent studying why people commit crime. Might you just as easily have been a botanist, a chemist, a physicist? Perhaps, or a mathematician, but I was always interested in psychology and I always intended to study it at university. When I was 16, I got books out of the library by Freud and by Eysenck which I read with great interest. Of course, when I was studying psychology at Cambridge in the 1960s, I was taught that Freud and Eysenck were not wonderful people! How do you think your own background affected you, coming from a grammar school in the north of England, and winning a state scholarship to read natural sciences at Cambridge University? I had a very scientific background, studying maths, physics and chemistry… I believe very much in the scientific approach, and I’ve always tried to do experiments where I could. If you were to set up a longitudinal study again, with the benefit of hindsight, how do you think you would do it differently? Well, I didn’t set it up, it was running when I started working on it. It would have been better if we had more frequent assessments, but that really depends on funding. With hindsight, we would have measured some different things. For example, we didn’t measure empathy in the early years. Certain constructs become more important over time. There was a big effort in the beginning to try to measure everything that was thought to be related to offending. But, I guess you didn’t know what was related to offending then, and that was why you were doing the study? Well, the data collection was based on knowledge at the time in the 1960s. 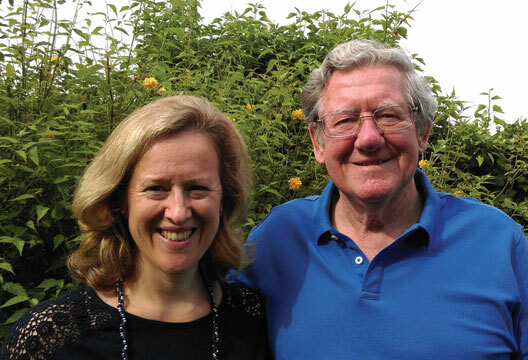 Dad, you have been hugely successful researcher, a prolific publisher and had a great influence on the development of criminology across the world. You were even president at the same time of the European Association of Psychology and Law and the American Society of Criminology. What has spurred you on? I’ve always tried to advance knowledge really. I think my PhD supervisor, Alan Watson, influenced me a great deal. He taught me how to write clearly. People I’ve collaborated with since like Alfred Blumstein and Rolf Loeber have influenced me. I’ve been very lucky really because I’ve always been able to pursue what interests me. I’ve also single-mindedly avoided administration, and that’s given me time to do research! I think you have always been very encouraging of your students and colleagues, and had many friends who are also criminologists. You have always been very kind as a father too, spending lots of time with us three girls teaching us to ride a bike, drive a car, playing games, doing puzzles, et cetera. What has led you to make time for people in the way that you do? I enjoyed very much playing with children at all ages, and I still do with the grandchildren. I enjoy collaborating with people and helping people. I’ve had about 30 PhD students and I still collaborate with many of them. I have longstanding collaborative relationships with many people, who like to continue working with me, and I learn a lot. Every time I collaborate with someone, I learn something new. I have to be honest, that even though you are a professor of psychological criminology, I never really think of you as a psychologist! Perhaps that is because you never really meet any of the people you have studied! Do you think your work would have been different if you had done more of the data collection yourself? Well, I don’t think it would have made the studies more biased. Clearly, what you say is correct in that I have rarely interviewed any of the participants in the Cambridge study myself, although I have met some of them. But I did hang around with delinquents in my teenage years when I was going to Everton football matches! I have also listened to tape recordings of the interviews with the participants and also I’ve been very keen to include case histories of the participants in our books. In our recent book on criminal recidivism we’ve included the case histories of some of the most prolific offenders. You’re right that I haven’t met face to face with that many criminals, but I’ve done my best to find out about them beyond the statistics, in terms of what they are really like. Being a clinical psychologist myself, I draw hugely on that concept of ‘scientific practitioner’, rather thanthinking of myself as a therapist. I am always interested to use scientific knowledge to help people to understand their strengths and difficulties, and to make changes to overcome their problems. I think this must relate to growing up with you and your love for science and empiricism. I know that I have teased you over the years about not using your knowledge and findings more to the greater good, more to change society to prevent the hardship that leads to criminal behaviour. How has your work actually changed society? Well, I think I have had some influence, certainly in this country, with government ministers and civil service policy makers. I’ve always advocated the need for early intervention. I had quite a bit of contact with the Home Office in the 1990s, and I think I may have influenced successive Green Papers and White Papers, which included ideas about early intervention. In 2006 I was very much involved with Tony Blair on his action plan on social exclusion, which was a very good plan in my opinion. It included various programmes such as parent training, nurse–family partnership programmes, treatment foster care and multisystemic therapy. One of my papers was put on the Prime Ministers website, alongside the statement that Tony Blair had been influenced by it. I think being a clinical psychologist working in CAMHS has affected my parenting greatly. I am more aware of the need to be available and responsive, to take time to really talk with my children. I was more critical of myself as a parent in the early years, particularly that my children never slept well, and I kept trying to change variables to maximise sleep to no avail. However, I think most of my parenting is driven by gut decisions, rather than based on any scientific understanding of learning and behaviour. How do you think being a psychologist affected your parenting? I think my parenting was based on gut decisions as well. But, I have to say, in fairness, that the majority of the parenting was done by your mum. She dealt with most of the difficult things, such as refereeing squabbles, whereas I could do most of the fun things like playing with you all. Your mum was the most brilliant at bringing you up. I was never anxious that any of you were going to be teenage delinquents. Having hung around with delinquents while I was a teenager myself, you and your sisters were very different. How about as a grandfather? You only had daughters yourself, and now are faced with six grandsons as well as four granddaughters. Do you think your studies made you more alert to boy misbehaviour, possibly mistaking normal toddler wilfulness for early delinquency? No, I don’t think so. There are some differences between boys and girls in the way they behave, but there are many individual differences between children. I’m not worried about any of my grandsons, they are all within the normal range, I’m happy to say! I think that using scientific study to actually find out things about human behaviour, which has policy implications, is one of your main legacies. Is that how you would like your work to be remembered? Yes, I think so. The main work that I have done has been advancing knowledge about risk and protective factors for offending, and about the development of offending and antisocial behaviour, and also the effect of life events on the course of development of offending. I’ve tried to draw practical implications for the early prevention of offending, and I’ve advocated consistently for early prevention with policy makers, so if I’m remembered at all, I hope it’s for that. Have you been surprised how much your work has been read across the world? Yes, I have been surprised. Recently at a conference a man from Peru came up to me and told me that my work is read in Peru, which was particularly surprising because it is not in Spanish. Looking back, I can remember swelling with pride the first time that one of your studies was referred to in a developmental psychology lecture by Norman Freeman when I was an undergraduate at Bristol University. I have always felt a great sense of pride in you and your achievements, especially when you were awarded an OBE and the Sellin-Glueck Award of the American Society of Criminology. You taught me a lot about the value of scientific inquiry, about the value of intelligence and of questioning assumed knowledge. When we were younger, you used to always debate with us from the other side of the argument, and I remember it used to make us girls annoyed at the time, and we would sometimes stomp off slamming the door. However, I think that this prepared me well for life as a psychologist, for being able to always see the other side of the argument, for being able to weigh up evidence meticulously, for being curious about other people’s world view. This has been immensely helpful to me in my life and career, and has fitted well with cognitive behavioural method. I think I have always tried to be kind, encouraging and compassionate to the people I meet, and this is something I learnt from you and Mum when I was growing up. Great! It is important to always consider alternative viewpoints and alternative explanations!